McCarthy’s Cafe was one of the fanciest nightclubs in town, back in the days when people dressed up to go drinking and dancing and eating and smoking. The address was 5600 Wayzata Blvd., on the north side of the road, which normally would have been in Golden Valley, except that the road and the city boundaries diverged in that area. It had cushy booths and a sophisticated atmosphere, as can be seen in these photos from 1956, courtesy Minnesota Historical Society. Keith Donald McCarthy was born on December 29, 1914, in his home at 5809 Goodrich in St. Louis Park. He graduated from St. Louis Park High School in 1933 and attended the University of Minnesota. After working for Northwestern Mutual Insurance Company in Minneapolis, he became a pilot for Northwest Airlines. During World War II he flew ice research missions for Honeywell. Once he became part owner of a restaurant and liquor store in 1942, however, the airline found it unseemly for one of its pilots to be in the bar business and gave him a choice. McCarthy was making more money at the restaurant so he gave up flying. 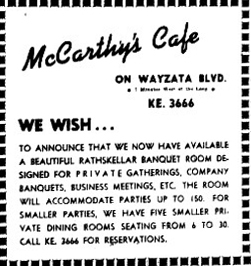 He left McCarthy’s Cafe in 1947 and relocated to Salt Lake City where he opened the Golden Flame Restaurant. He moved to Woodside, California, (Bay area) in the early 1950s. There he founded McCarthy Company Insurance and “made millions” until he retired in 1985. Keith’s first wife was Virginia Howard (December 20, 1916 – March 14, 1981). Daughter Patricia J. McCarthy was born in about 1950 and she married James B. Brady in 1976. After Virginia’s death he married Jean Smith. His obituary said that “he loved flying, music and sailing. He owned a boat docked at Pier 39 in San Francisco and sailed the Bay as much as possible.” He also sailed the Adriatic and Aegean seas. Keith McCarthy died on January 7, 2002, at age 87. Meredith McCarthy tells the story that his brother Keith applied for a liquor license for a restaurant and bar at Highway 100 and Excelsior, where the Lilac Lanes Cafe and later the Kings Inn went. Ceding to pressure from local ministers, the City Council said no to the location, but gave him a liquor license, even though he had no experience with a restaurant. This was in 1942, and there wouldn’t be another license available until the next census (1950). Keith was 25-26 years old at the time. It’s said that Mayor William Martin was on gangster Tommy Banks’ payroll (around $50 a month) and he introduced Tommy to Keith. Tommy had wanted a restaurant on Wayzata Blvd. but couldn’t get one as a convicted felon. They purchased 9+ acres on either side of Wayzata Blvd. and sold the southern part to the Minneapolis Baseball people. They started to build in 1942. Because of the war there were restrictions, but if they could get a certain amount into the ground by a certain date, they could keep going. This is why there is no basement. The restaurant opened in 1942. The building was a long rambler type, covered with stucco. The windows were crisscrossed. The northeast corner was the liquor store, southeast was the entrance, east was parking, and west was the restaurant. There were booths down the center, and other, private booths where you couldn’t be seen. Over the bar was a big picture window with a rock garden and waterfall. The place was always impeccably landscaped. Frank Rerat, Chef; Ted Culbertson, Manager. Ted Culbertson was first the liquor store manager, then restaurant manager. He was brought in from a liquor store downtown. 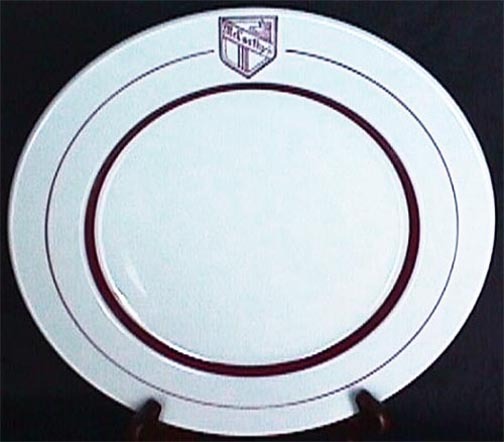 He left in 1946 to establish Culbertson’s. Jerry Murphy, a former Marine from Duluth, was manager for a very long time. In March 1946, excavation began for an addition to the west side that quadrupled the size of the restaurant. The new stone exterior gave the building an Old English appearance. Landscaping was done by Morten Arneson. The design won an award from “architects of the country who recently voted it the country’s outstanding suburban restaurant, architectuarily” according to the July 11, 1947, edition of the Dispatch. An actor from Fibber McGee and Molly, who, although he was in radio, got recognized a lot. Auzie Dial, a black pianist who was really a jazz musician, but played pop tunes for the crowd. Mel Hanson, who never paid for anything less than a $20 bill, even for a 50 cent drink. A Jim Klobuchar article reported that he retired (from owning apartments) broke but happy. Lorraine Johnson was a popular waitress. The mayor’s chauffeur usually got drunk. 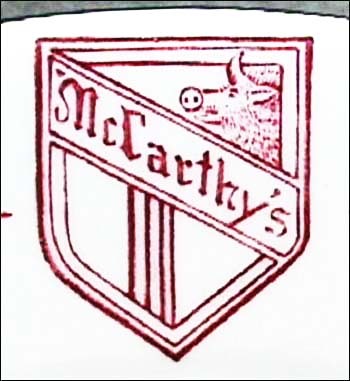 Keith McCarthy left McCarthy’s in 1947 but left his name as a legacy. In 1952 Highway 12 was widened and McCarthy’s placed on a service road; in 1953 the road was scheduled to be redesigned, and a signal was installed at the intersection. Officers in 1956, each holding 110 shares, were Jeremiah Murphy, Rita Banks, and H.H. Clark. This photo is in the Minnesota Historical Society database as McCarthy’s in 1956, but it it probably (more than probably) not. 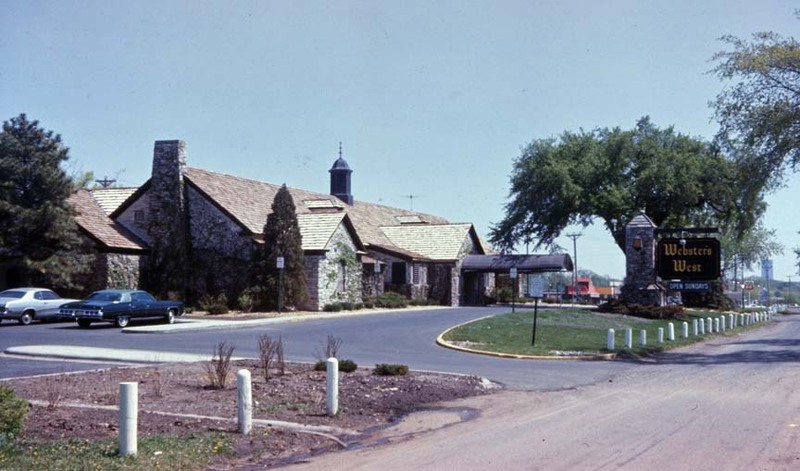 Ben Haney wrote to say that it looks suspiciously like the clubhouse at the Hiawatha Golf Course in South Minneapolis! Tommy Banks didn’t have a lot of time to enjoy his place from 1955-1957, since he was residing in Leavenworth on a tax fraud charge. The correspondence sent from that Institution to McCarthy indicated that something was up and that Tommy still called the shots. 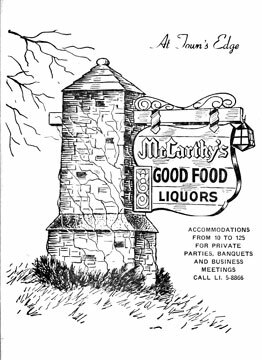 A 1962 ad for McCarthy’s – “At Town’s Edge” – ad promised “Fast, Efficient Service to Club, Office, or Home.” John Ralles was the Liquor Store Manager. In 1966 Ralles was replaced by Glenn A. McArthur, who has written a memoir about his time at the restaurant and his impressions of his boss Tommy Banks – a MUST READ! The Clintons family had owned the building that housed Freddie’s Cafe in downtown Minneapolis. That building burned down in 1966. The family also owned a motel in California, two lodges in Aspen, and apartment houses in Miami. Clinton planned to build a motel of 250 to 300 rooms on the property “as quickly as possible,” reported the Minneapolis Tribune on April 17, 1968. 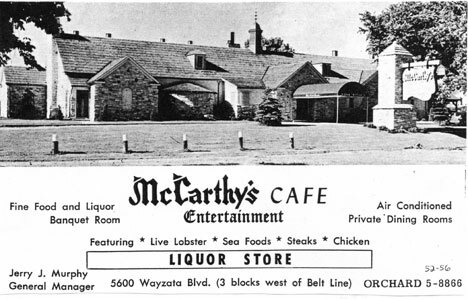 On January 7, 1970, the Minneapolis Star reported that new owner Stanford Clinton, Jr. sued the former owners of McCarthy’s, including Tommy Banks, charging that they sold him the cafe with fraud and breach of contract. “Clinton charged he found kitchen equipment, plumbing and electrical installations in disrepair, the carpet shoddy and the roof leaky.” He estimated that the cost of repairs would be $250,000. He also charged that the sellers misrepresented the retaurant’s worth by showing him financial statements for the previous year rather than the year of the sale. He sought return of his $951,000 purchase price and more than $500,000 in damages. 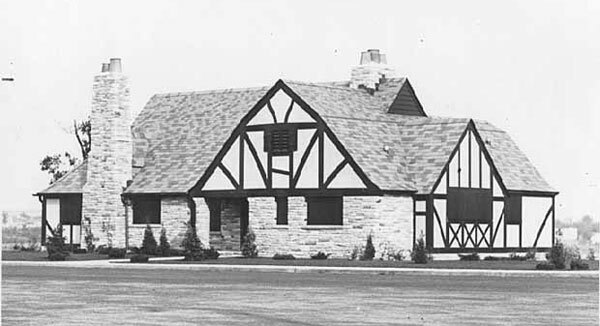 The restaurant became Eddie Webster’s-West sometime after 1972. 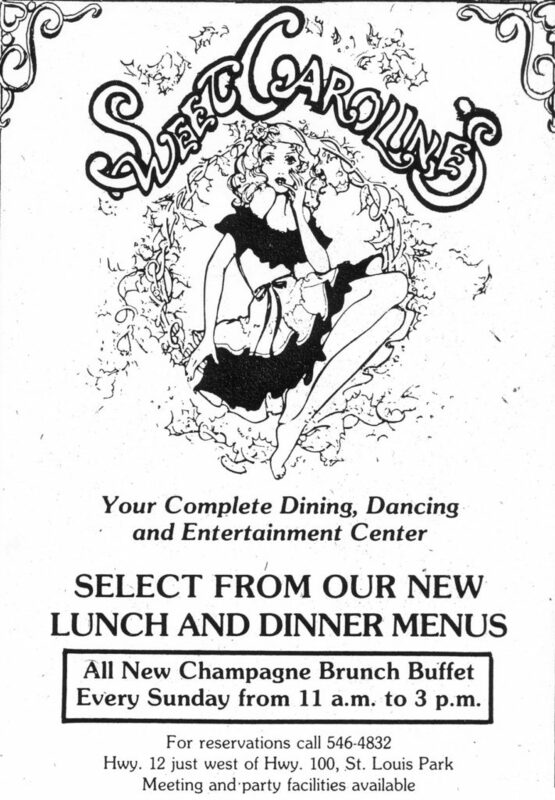 In January 1980 the restaurant reopened as Sweet Caroline’s. An article in the Park High Echo noted its stained glass windows, fireplace, Tater Bar, and many small rooms. There were two bars, one with disco and one with a rock band. 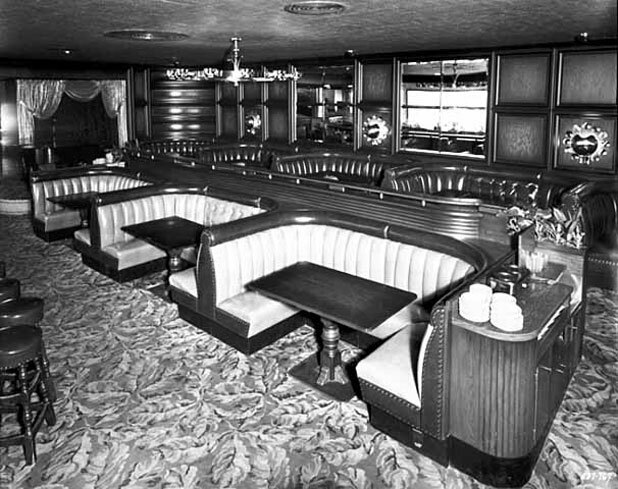 The dining area accommodated 192 people, with another 75 seats in the Tater Bar. The director of operations was Shel Berlatsky. The building was razed in about 1991 to build I-394 and thousands of cars drive over the spot every day.